The future of Lancaster’s museums was looking a little more positive after city councillors said they wanted the county council to examine the idea of supporting a charitable trust. The Judges’ Lodgings is currently due to close on March 31 but councillors expressed a wish to look at further ways of saving the attraction and others in the city. Last night’s full council meeting heard that officers from the Victoria and Albert Museum in London had written to support the plight of the Judges’ Lodgings, which they declared was of “national importance”. 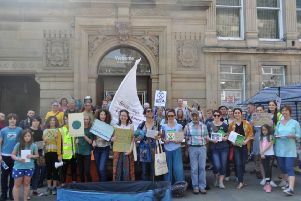 Around 7,000 local and national signatures have been collected on a petition to save the museum, which houses a multi-million pound collection of Waring and Gillow furniture as well as important artwork. David Redmore from the Beyond the Castle project said at the meeting: “We recognise that the museum has serious issues and we are willing to explore new ideas. “We believe a way through can and should be found. “What can possibly replace such a rich heritage in Lancaster? We have enormous potential here and we need to work together to save every part of our heritage. Coun Darren Clifford said: “I agree our cultural heritage is important and we should make more of it. Coun Nick Wilkinson, who proposed the motion which was approved by members, said: “We are not asking the council to take over the running of the Judges’ Lodgings or any costs or risks. “I believe the museums across Lancaster can be run differently. They have major potential to add to the visitor attraction of Lancaster and district. Coun Wilkinson said the idea was similar to that of the trust set up to run The Dukes in 1991 by the council.